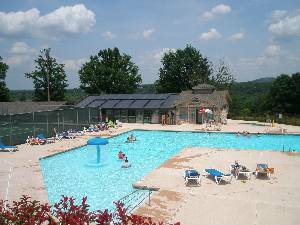 Branson is a year round vacation destination quietly nestled in the Ozark Mountains, about 35 miles south of Springfield. Outdoors, the Ozarks as well as 3 neighboring lakes offer those with a penchant for Mother Nature ample opportunity for exploration. Hiking, fishing, sailing, canoeing, kayaking, ballooning, golf and theme parks can all be a part of a day's itenerary. A hiking trail into a beautiful Missouri conservation area begins on the perimeter of Pointe Royale giving guests the opportunity to explore the natural beauty of the Ozark's. Table Rock Lake, Lake Taneycomo and Bull Shoals Lake offer water enthusiasts an incredible choice of activities. Visitors can swim, ski, boat, sail, scuba dive, jet ski, parasail and of course, fish. All area lakes are easily accessible, making Branson the perfect choice for a secluded, rustic getaway, or an action packed family vacation. Golfers come to Branson to enjoy the wonderful views offered by over 10 area courses. Challenging loops, set among the Ozark's natural beauty, combine to make Branson a wonderful golf destination. Branson Creek Golf Club was designed by architect Tom Fazio. There are various ways to experience the surrounding Branson area. One of the best is the Branson Scenic Railway. Sit in vintage decorated rail cars as you meander over a 40 mile round trip that takes you through the Ozarks and neighboring valleys. You may also want to experience the Slice of the Ozark's, a three hour narrated tour of Branson and the lakes area. This tour includes Country Music Boulevard, historic downtown, College of the Ozark's, and Scenic Overlook. Children of all ages will enjoy the area's many theme attractions. Silver Dollar City is an 1880's theme park that takes visitors on a remarkable journey back in time. Throughout the park, guests experience true, old fashioned Americana and Ozark history from the pioneer homestead to the blacksmith's shop. But, tucked behind the trees, guests can experience adrenaline surges with state-of-the-art rides including the first wet/dry rollar coaster of its' kind in the world. White water is another wonderful family adventure. The 12-acre water park has the area's largest variety of water rides and attractions. For years, Branson served up a blue plate special of country music entertainment. In the early 1990's, CBS's 60 Minutes labled Branson the "country music capital of the world". Branson exploded when famous acts began coming in droves perfoming in, and in some cases, building their own theatres. But, while country music is the main theme, everything from blues, classical, Broadway show tunes, and heavy metal rock and roll can be heard in Branson venues. There are nearly 40 theatres, offering over 80 shows daily. Branson bills itself as "America's entertainment capital". Take a moonlit dinner cruise on one of Branson's lakes, visit The Butterfly Place and walk among over 1,000 of the worlds most beautiful butterflies, or journey by boat through some of the Ozark's hidden caves. Regardless of how you choose to spend your Branson vacation, you can rest assured that you could not find a destination with more exciting opportunities! 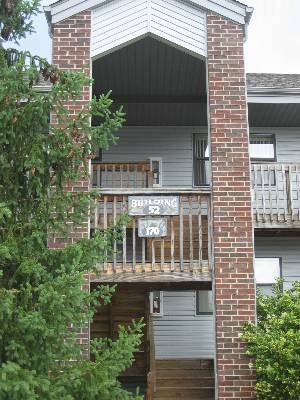 You are bidding on a 2 bedroom/2 bathroom condominium which features a fully equipped kitchen, king bed in the master bedroom, and a double or queen in the second bedroom. There is also a queen size sleeper sofa. 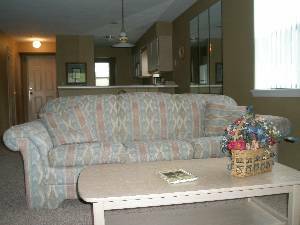 The condo sleeps 6 people and has a spectacular view of the golf course. 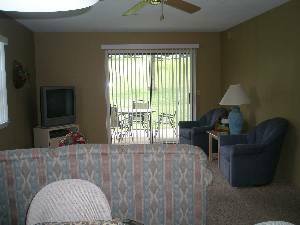 Unit has a television with cable and DVD in the living area and a television in the master bedroom. There is a full size washer and dryer and a jacuzzi tub. 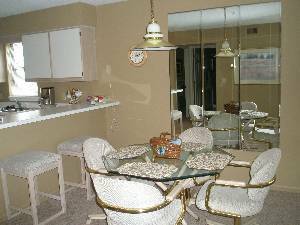 Units are individually owned, so decor may vary from that pictured. 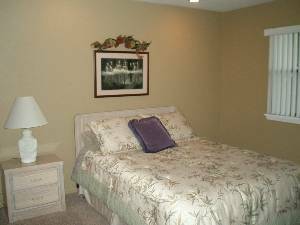 May Special: Any week stay during the month of May only $550!! Must be 21 years of age or accompanied by a parent or guardian to check-in. 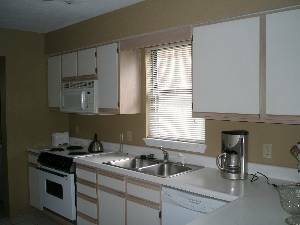 Units are weekly rentals from Saturday to Saturday. Smoking and pets are prohibited. Units are individually owned so decor may vary. Deposit: $200 refundable damage deposit required. Cancellations and Refunds: $250 required at the time of booking. Remaining balance due 30 days prior to check-in date. Cancellations permitted up to 30 days prior to check-in. $250 is non-refundable. 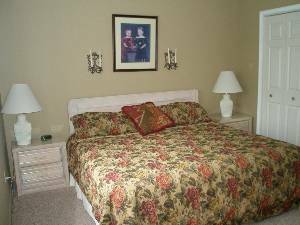 Other Fees: $200 refundable security deposit required.